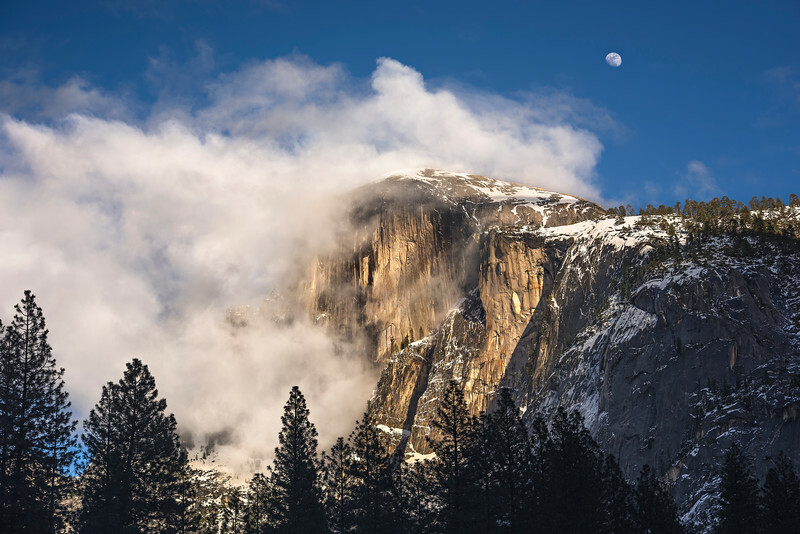 "Moon and Clouds over Half Dome in Yosemite National Park"
"Moon and Clouds over Half Dome in Yosemite National Park" This is another capture from February 2016 with the clouds swirling over Half Dome and the Moon rising. I really love that so many images of Half Dome can be different as it is the clouds and lighting and composition that can really make them different. I might try this image in monochrome/black and white and see how it comes out. I normally prefer color images but we will have to see! You always have to look around when you are in Yosemite as there are magical things all around you. Watching the clouds hugging the face of Half Dome was mystical! Perfectly set against the contrast of the blue sky. Let me know if you enjoy it and please share. Image © John Harrison Photography.